Montreal’s winters are historically known as cold and snowy. With that, this hockey loving city has a true passion for fireplaces. The romance and allure of a fireplace can also sometimes border on necessity. The city of Montreal and some of the “de-merged” cities on the island have recently created a bylaw which will ban the use of any solid-fuel appliances which have been accused of emitting certain levels of fines particles in the air. (For more specific detailed information on the bylaw, please click here) The purpose of this article is to inform the population of Montreal that there currently exist several solutions to this bylaw and to inform you on the differences between the 3 major fuel types. So what does all of this mean? 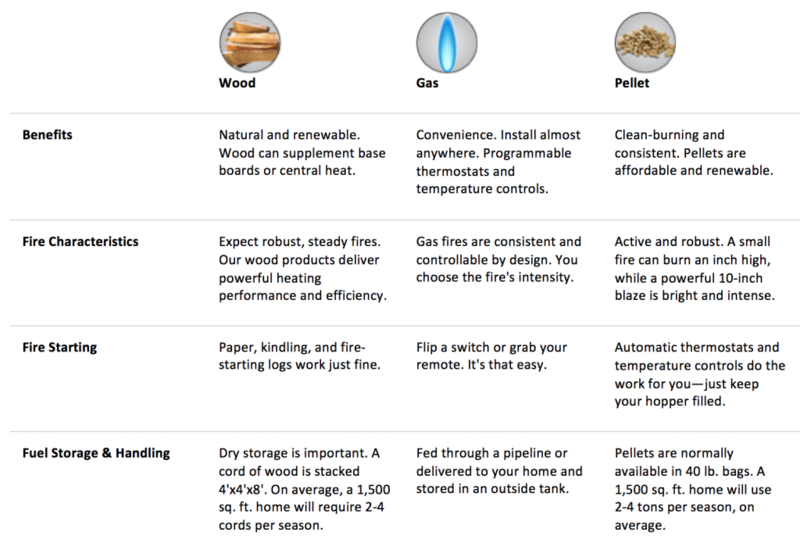 There are many pellet and wood stoves or inserts available that meet the required efficiencies allowing you to keep burning wood or pellets while abiding by the new bylaw. Gas is exempt from this bylaw which means you can choose any of our models.